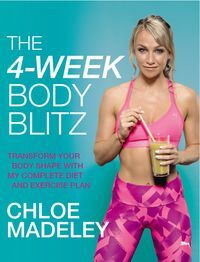 Chloe Madeley's 4-Week Body Blitz is an exercise and nutrition plan that shows you how to transform your body shape in just 28 days. Do you have a party dress to squeeze into for the Christmas season? If you have a short-term weight-loss goal, then this is the book for you! Chloe Madeley is a qualified personal trainer who specialises in body shape transformation. In the 4-Week Body Blitz, she lays out the exercises you need to do and the food you should eat every single day for four weeks in order to get yourself in shape. Follow Chloe's instructions and you will see a significant difference in how your body looks. What?s more, you don't need a gym membership or expensive equipment to follow Chloe's plan. This comprehensive, fully illustrated guide is full of delicious, easy recipes to fuel your exercise and aid your weight-loss.